Digital Disconnect: How Capitalism is Turning the Internet Against Democracy discusses how politics and the “capitalist*” economic system of the United States has very much warped the initial vision and potential of a non-commercial democratic Internet. In it noted scholar and activist Robert W. McChesney does a good job of illustrating the “banana republic” — that is the corporately-controlled — status of the U.S. state. Beyond just communication media, McChesney describes how for the overall society, “what is emerging veers toward a classic definition of fascism: the state and large corporations working hand in hand to promote corporate interests, and a state preoccupied with militarism, secrecy, propaganda and surveillance.” And this understanding of U.S. society is very important in understanding the business of the Internet. McChesney cites a scene from The Godfather II where the gangsters meet to divide up their control of Cuba and then show their appreciation for how nice it is to be working in a country “with a friendly government that knows how to work with ‘private enterprise'” — this, McChesney says, is an apt analogy showing the true nature of who controls the Internet and the trend of continuing (and increased) consolidation of this control. This quote frames the importance of Digital Disconnect; it provides a deep analysis of the contributing factors and potential ways forward in relation to what has become such a vital element in shaping our societies and the way the future will develop. McChesney starts off by describing and examining the different sets of views — from the “celebrants” and the “skeptics” — about the Internet’s potential and impact upon society. McChesney then adds that a critical omission was that most of these people did not have a sufficient analysis of the impact of “capitalism*” and the effect it has had on the development of the Internet. The second chapter explores this “really existing” capitalist economic system that exists in the U.S. and elsewhere, with specific aim of how it is relevant to the communications analysis that is the rest of the book. McChesney has developed his thinking through a lengthy career of academic research, writing 12 other authored or co-authored books and involvement in media reform advising and advocacy, including being a co-founder and past president of the Free Press organization. In Digital Disconnect, he states that now, “We are in a position, in some respects for the first time, to make sense of the Internet experience and highlight the cutting-edge issues it poses for society.” And thus, he attempts to address some of the “big questions” out there, the main one being exactly that: to make sense of what is happening with the Internet and society. One major fact to help make sense of things is that “in short, the Internet monopolists sit at the commanding heights of U.S. and world capitalism.” This is backed up by the fact that in 2012, 13 of the 30 largest U.S. corporations were Internet or computer companies. McChesney illustrates the way that these major corporations have worked and lobbied with governments to set policy in their own favour, as well as illuminating how Internet factors work to create monopoly-inducing conditions. One statistic he cites is from Wired magazine: in 2001 the top ten websites accounted for 31 per cent of all page views, 40 per cent in 2006 and about 75 per cent in 2010. He also breaks down the near-monopolies in different areas: Google controls nearly 70 per cent of the search-engine market and 97 per cent of mobile searching; Microsoft Windows accounts for 90 per cent of computer operating systems; Apple’s iTunes has 87 per cent market share of digital music downloads and 70 per cent of media-player downloads; and Amazon sells between 70 and 80 per cent of all books and e-books online. This is not only true when it comes to surveillance operations by the government — which he analyzes in terms of the nature of the relationship between the government and the major Internet corporations — but more broadly as influenced by “targeted-advertising” approaches that reward sites for collecting as much information on their visitors as possible. He notes the change from 2003, when digital publishers received almost all the advertising money spent on their sites, to 2010, where nearly 80 per cent of the advertising money went instead to the ad networks and data collectors and managers. Google and Facebook are the two most noted data gathering companies. In terms of journalism, he gives a list of the fundamental characteristics of the type of journalism required for a healthy democratic society and then describes the deepening crisis in journalism — basically a reduction in original news gathering and no real difference between almost all mainstream journalistic thinking and establishment political thinking. McChesney argues this crisis is not caused by digital communications, but simply quickened by it. Further analysis leads him to the argument that there is no for-profit business model that works for the type of journalism that we need for the public good; instead it must be publicly supported and invested in. 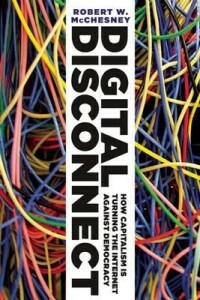 Overall, McChesney’s conclusion to the digital problems laid out in Digital Disconnect is that a large, broad progressive movement is needed, not one solely devoted to the Internet or media, but one that does necessarily challenge the “really existing capitalism” that has so much negative influence on society’s overall functioning and on people’s individual lives. McChesney calls on people concerned with the media to broaden their focus and make joint cause with others working towards social justice, and he sees this current time as a critical juncture where real substantive changes are possible. Digital Disconnect shows how and why this broad movement is important, and helps make sense of how we could get this reform to work.